The sun god, represented as the K’in glyph in Classic times, had a Roman nose, central notched tooth, and crossed eyes with square pupils. Considered a male deity and addressed as Father Sun, he was ruler of time and space, and oversaw the seasonal agricultural cycles. K’inich Ahau—Sun-Faced Lord—was identified with ruling lineages and connected with the Maize God, bringer of fertility and renewal. In the late Classic many Maya rulers added K’inich to their names, signifying their oneness with the sun deity. To demonstrate this unity, rulers needed astronomical knowledge to predict exact timing of the sun’s annual cycle. Through this they directed farmers when planting and harvesting should take place. The sun’s arrival at important stations during the year was celebrated with rituals, and correct timing was essential. The ruler’s sacred duty required properly performing these rituals, offering the deities suitable gifts, and thus maintaining beneficent relations between Gods and humans. This relationship with time and the cosmos was expressed by the movements of the sun. Divine rulers depended on their astronomical knowledge to predict the solstice, equinox, zenith and nadir passages of the sun. They needed markers to help identify when the sun approached these stations, and to signal the exact moment of arrival. In the Early Classic Maya period, solar-oriented structures called “Group E” complexes appeared throughout the Maya area. These complexes usually had four buildings: three modest height pyramids in a string along the eastern horizon, and a single temple standing directly west of them that was used for sighting. From the sighting temple, observers would watch for the rising sun behind the north pyramid for summer solstice, the middle pyramid for the equinoxes, and the south pyramid for winter solstice. Maya architecture was developed to encode ancient astronomical knowledge and serve as a focus for sacred rituals. Structures were built and sited in positions that would align with the sun’s movements and produce solar-related phenomena. These structures could be witnessed by multitudes and were used to perform dramatic ceremonies. Among the best known examples, two are located in Yucatán, Mexico. At Dzibilchaltun located just north of Mérida, Yucatán, a famous equinox phenomenon draws thousands of visitors every March 21 and September 21. A square shaped, small temple called “The Temple of the Seven Dolls” sits on top of a 2-tiered 4-sided platform that is oriented east-west. Doorways on four sides of the temple give unobstructed view through its interior. From the west, a long causeway leads to the structure, beginning from viewing platforms at the edge of the main portion of the city. People gather in the pre-dawn to stand on the platforms or along the causeway, waiting hushed moments as the eastern sky slowly brightens. As the sun breaks the horizon, it seems to rise from within the temple, its blazing globe filling the east-west doorways. The sun continues upward and appears to burst forth from the flat roof of the temple. As in ancient times, modern Maya elders conduct solar rituals with their followers to honor the sun’s power and abundant energies. The large Postclassic site Chichén Itzá is east of Mérida, has been named a New 7 Wonders of the World; possibly the best known ancient Maya city. A striking solar phenomenon takes place on the equinoxes called the “Descent of the Feathered Serpent” that is a national holiday, attended by hundreds of thousands of Mexicans and foreign visitors. The largest pyramid in the site, the Pyramid of Kukulkan (called El Castillo by early explorers) sits in the vast central plaza. This four-sided pyramid has stairs ascending each side and a square temple on top with prominent serpent pillars and carvings. As the equinox sun begins to set, its light plays across seven of the nine tiers of the pyramid and casts triangular shadows on the stairway on the east side. The entire length of the stone balustrade along these stairs is carved as a feathered serpent. The serpent’s head rests on the ground, jaws open wide with protruding fangs and tongue. Its tail reaches upward from the temple platform on top, rattles pointed to the cosmos. The changing size of the triangular shadows makes the serpent seem to be moving down the pyramid. 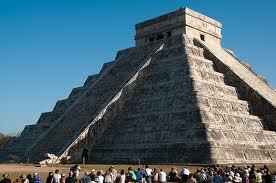 Other solar and calendar phenomena are encoded in the Pyramid of Kukulkan. At the solstices, half of the pyramid appears in light and the other half is in darkness. The four sides of the pyramid indicate seasons of the year, and the 91 steps of each stairway combine to make 364 plus the upper platform to represent the solar year, 365 days. The rectangular temple on top has 20 roof projections for the 20 days of the Maya month. The nine tiers viewed from any one side, split by the stairway, represent the 18 months of the Mayan year. Along the lowest tier there are 26 marks on each side of the stairway; these together make 52 for the years in the Tunben K’ak calendar, a time period for “New Fire” ceremonies that follows the Pleiadian cycle. 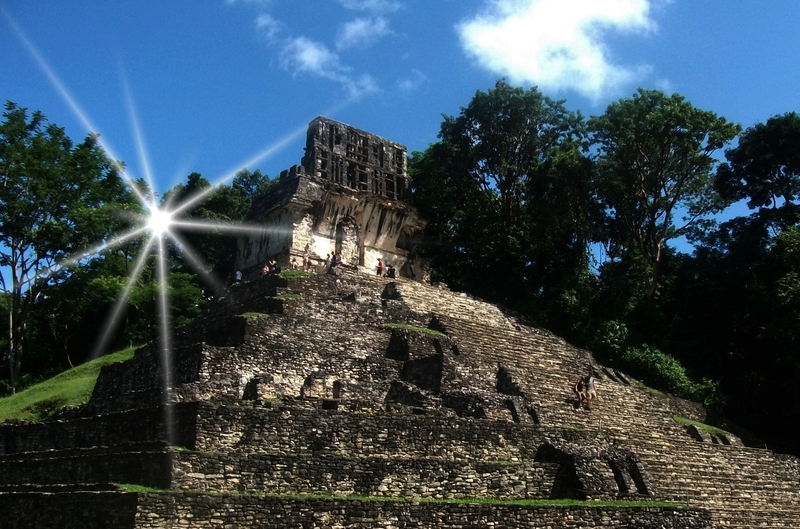 In the Classic city of Palenque, more complex types of solar phenomena were coded into architecture of complexes. These structures served both ritual purposes and carried symbolic functions, many intended for only rulers and elite. One of the first identified was the setting sun at winter solstice, which sets over the ridge directly behind the Temple of the Inscriptions. This temple is the burial monument of K’inich Janaab Pakal, Palenque’s greatest ruler. 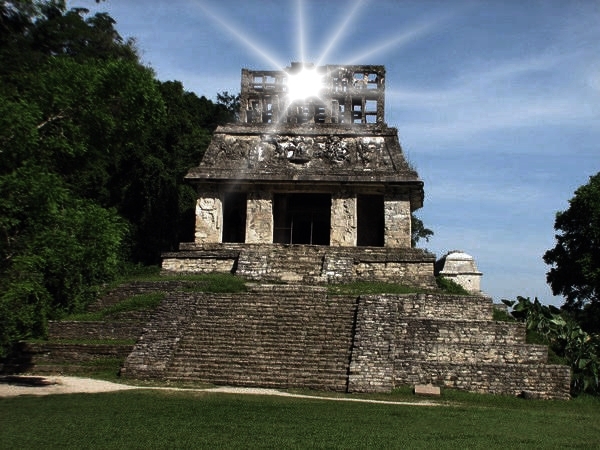 Archeologist Linda Schele interpreted this as the “dying” sun appearing to enter the earth through Pakal’s royal tomb; a solar event that was an annual re-enactment of the ruler’s descent into the underworld. Another solar event occurs at sunset during summer solstice. Sunlight enters the western window of the anterior corridor of the Temple of the Inscriptions, passes through the eastern window directly across the corridor, and then highlights the upper platform of the Temple of the Cross. 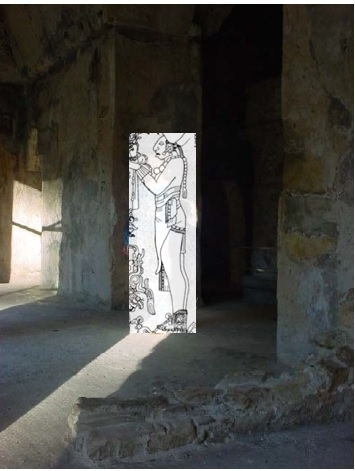 Once a major stela (rare at Palenque) stood on this spot; researchers suggest that Stela 1 was a portrait of Pakal or his son Kan Bahlam, and marked a solar observation point. The Temple of the Inscriptions has a longitudinal orientation to the summer solstice, and is remarkably aligned to the Temple of the Cross. 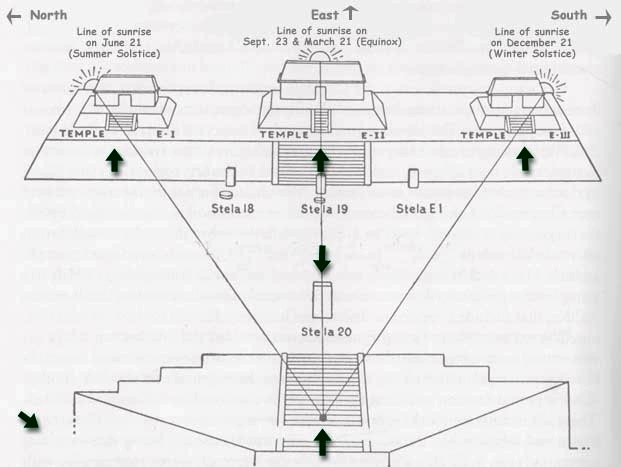 Schele believed that the light effects of summer solstice represented the transfer of royal power from Pakal to Kan Bahlam, who built the Cross Group and completed his father’s burial temple. 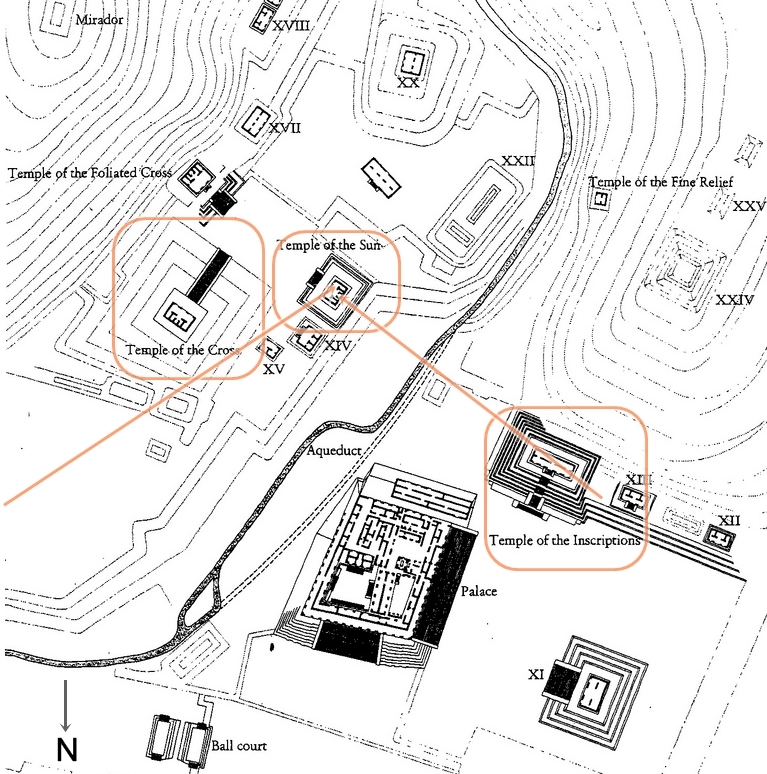 The Cross Group was composed of three major pyramid-temples and two minor ones. It was Kan Bahlam’s ultimate creative expression, which proclaimed Palenque as the reflection of the center of the universe. The three temples represented the three hearthstones of Maya creation mythology, stars in the Orion cluster. In each Maya home the 3-stone arrangement for cooking reflected the stars in Orion’s belt, the home of the creator Gods. This hearthstone arrangement is still used in traditional Maya families. There are numerous solar, lunar, and stellar associations within the structures of The Cross Group, consisting of the Temple of the Cross, Temple of the Foliated Cross, and Temple of the Sun. Solstice, equinox, zenith, and nadir light phenomena are encoded in these structures. Only one is included here: The summer solstice event. 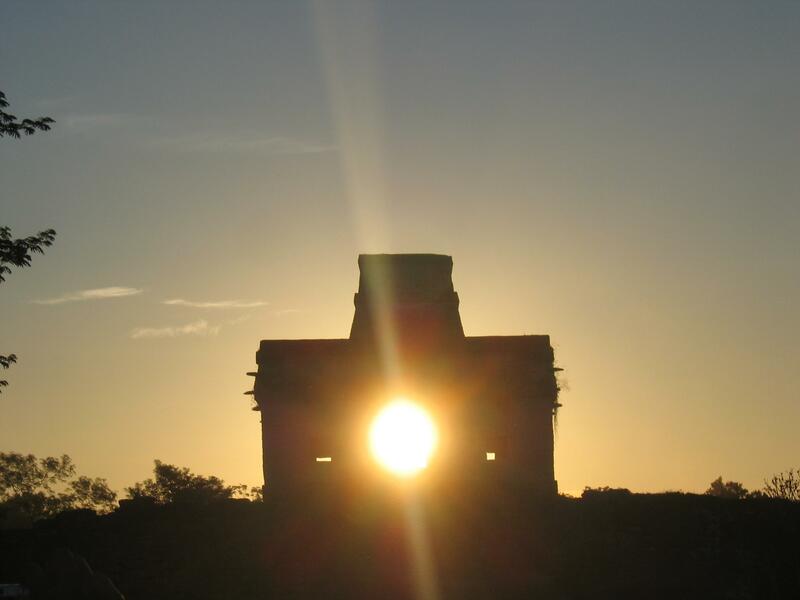 On the morning of June 21, at 7:00 am, the sun when viewed from inside the Temple of the Sun rises from its north-most point on the horizon, and touches the northwest corner of the Temple of the Cross. Sunlight then enters the Temple of the Sun at an oblique angle (50 degrees north of the transverse axis). This diagonal streak of light entering through the northeast doorway continues to creep across the temple floor. As it probes into the dark interior, a broad ray appears. This ray of light gets narrower as it is blocked by consecutive walls, until it becomes a thin beam that strikes the corner of the southwest chamber. By 7:30 am the rays recede from the temple interior. This solstice alignment was intentional, for the Mayas aligned the temple precisely. They set the northeast corner back 10 cm. from the rest of the facade, to allow the sun to penetrate the interior at the correct angle. The interior walls were constructed to focus the sunrays. Openings were made in walls A and B to permit sunrays to shine through, while wall C has no openings. The doorways had to be perfectly spaced. A high level of astrological knowledge was necessary for this construction. 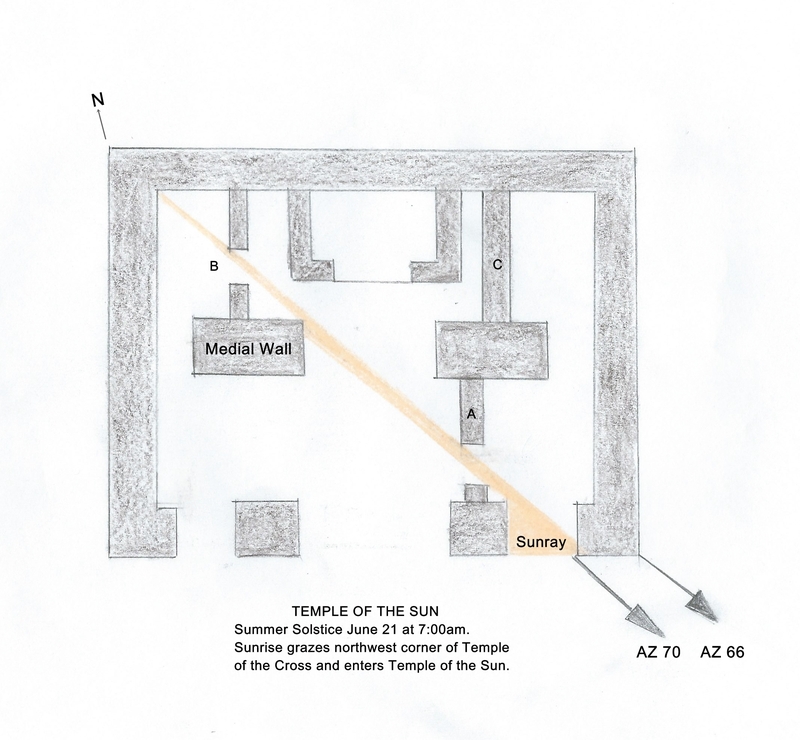 The diagonal of the temple (66 degrees 14 minutes) is only one degree off the true azimuth for summer solstice sunrise (65 degrees 14 minutes). However, it is the visible light entering the temple at 70 degrees that creates the light effect. Knowledge of these relationships was needed prior to construction of the temple. Only the elite would observe sunrays deep inside the temple, but the diagonal light entering the northeast doorway could be seen by crowds gathered in the plaza between the Cross Group temples. Another dramatic effect took place when a person standing directly in the center of the temple became fully illuminated by dazzling sunrays, in view of the plaza crowd. One can imagine that Kan Bahlam stood there to reaffirm his personification of the Sun God and inheritor of the Palenque dynasty. A final light phenomenon occurs on the evening of summer solstice, at 6:18 pm. Standing by a small altar stone near the base of the Temple of the Cross stairway, observers can watch the sun dip past the mountainside behind the Temple of the Inscriptions. The last rays of the sun pierce directly through the center of the Temple of the Sun roofcomb. On the roofcomb a seated figure holds a double-headed serpent surrounded by sky bands. This is a typical portrayal of rulers in command of the cosmos and energies of life and death. He sits upon an Earth Monster mask, representing the mountain behind the Temple of the Sun. A smaller figure on the roof frieze below is Kan Bahlam appearing as the Jester God/God K manikin, symbol of divine royal lineage. 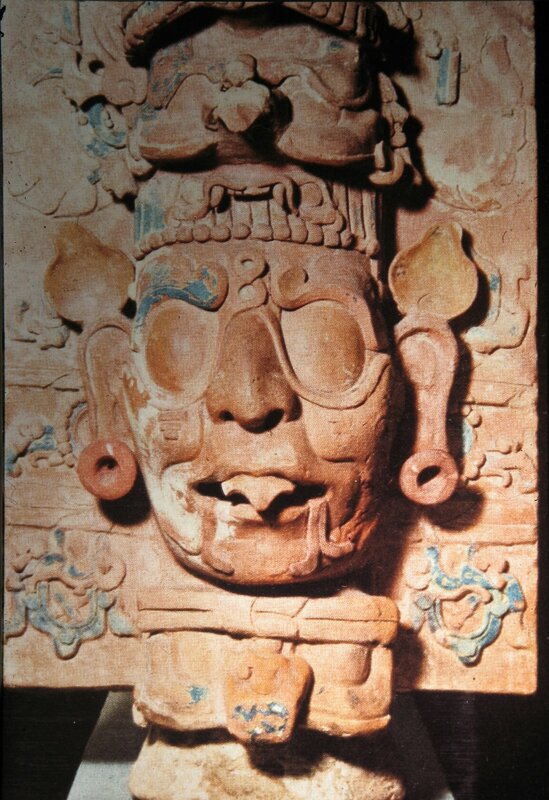 In multiple ways, the solar phenomena encoded in Maya structures proclaimed the metaphoric and symbolic associations of the ruling elite with the Sun God and cosmic deities. Charged with religious symbolism, the Cross Group embodied the movements of sun and moon, and conveyed a powerful message by the new ruler, Kan Bahlam. 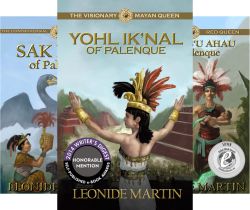 Learn about the early life of K’inich Kan Bahlam in my book telling the story of his mother, The Mayan Red Queen: Tz’aakb’u Ahau of Palenque. 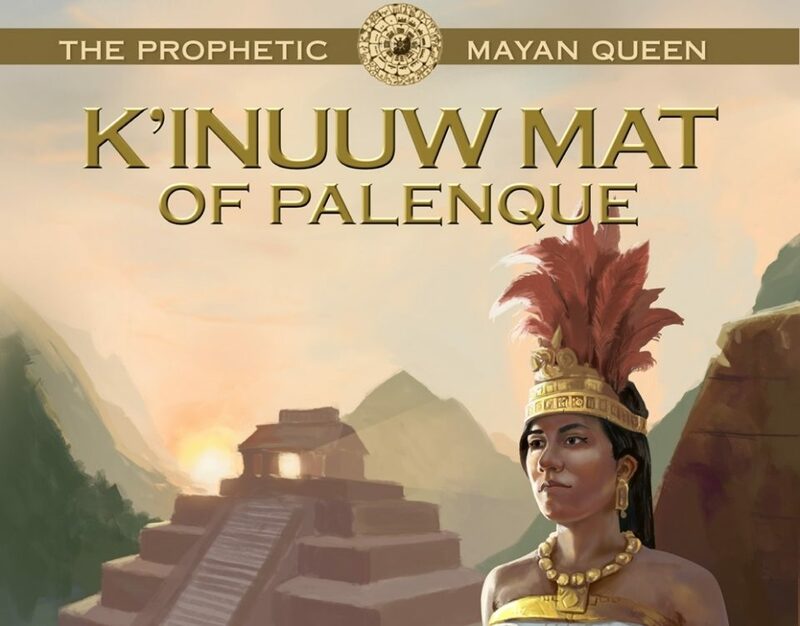 Kan Bahlam’s later life when he ascends to rulership and builds the Cross Group is told in my forthcoming book, The Prophetic Mayan Queen: K’inuuw Mat of Palenque. Alonso Mendez, Edwin L. Barnhart, Christopher Powell, and Carol Karasik. “Astronomical Observations from the Temple of the Sun.” 2005. Accessed online 12-6-2010 http://www.observations_temple_sun.pdf. Hunbatz Men. The 8 Calendars of the Maya. Bear & Company, Rochester, VT, 2010. Susan Milbrath. 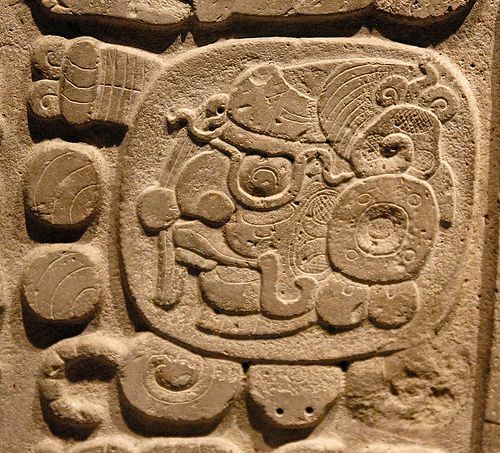 Star Gods of the Maya: Astronomy in Art, Folklore, and Calendars. University of Texas Press, Austin, 1999. David Stuart & George Stuart. 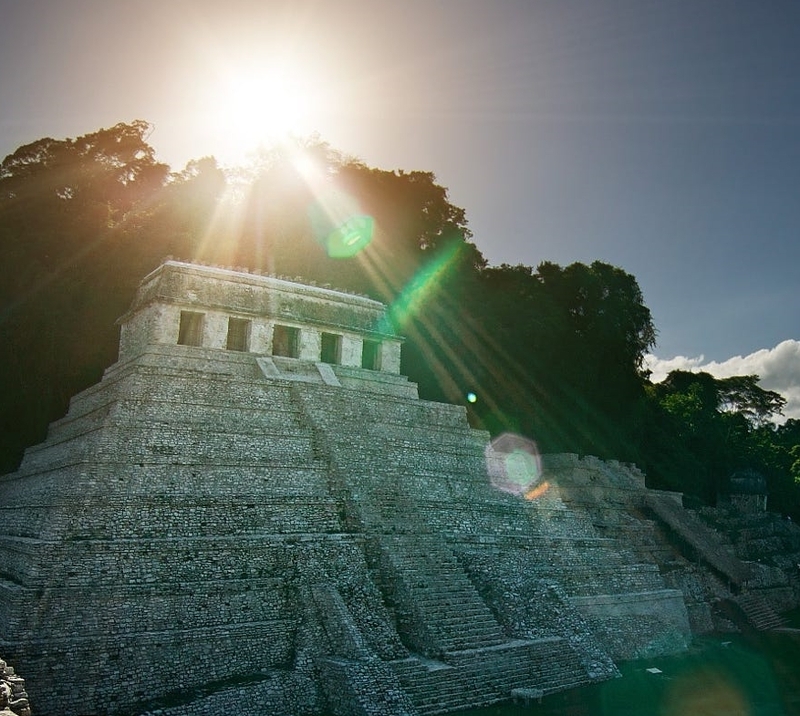 Palenque: Eternal City of the Maya. Thames & Hudson, London, 2008. By Leonide Martin in Ancient Mayans, Archeological Sites, Equinox solar phenomena, Janaab Pakal, Maya Culture/Civilization, Mayan Calendars, Mayan history, Mayan pyramids, Mayan rituals, Mayan ruins, Merida, Palenque, Research, Solstice solar phenomena, Sun God, Yucatan on December 9, 2016 .